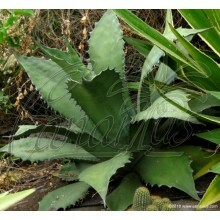 We selected this hybrid here in Tenerife. It is a particularly nice and hardy cross between Heliconia subulata and H. pendula, which are two cool-hardy species, good for the subtropics. 'Pendulata Spotty Stems' is a particularly nice and hardy "x Pendulata cross" between Heliconia subulata and H. pendula, which are two cool-hardy species, good for the subtropics. 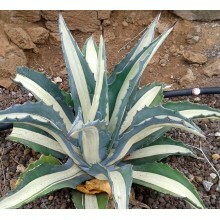 We selected this hybrid here in Tenerife in 2010. 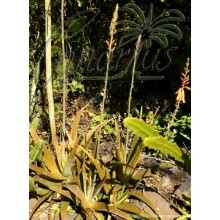 - Stems are beautifully waxy and spotted with maroon blotches. 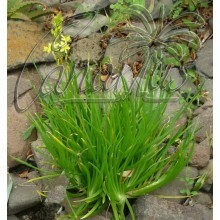 - Inflorescences are much like H. subulata, but they are longer and some will randomly twist. The narrow leaves and tight clumping habit makes our Heliconia x 'Pendulata Spotty Stems' more resistant to wind and therefore to cold.